Dr. Suskind’s involvement with early childhood education and literacy comes from a rather unique perspective. Dr. Suskind is a pediatric cochlear implant surgeon, giving children the gift of sound and hearing. It was during the post-op and follow-ups with her young patients that she began noticing peculiarities and shocking differences in language acquisition, intelligence and emotional development. Her observations led her down the vast rabbit-hole of research, study and data regarding early childhood brain development. The most notable study on this field is the Hart & Risley 30 Million Word Gap study conducted in the 1980’s. Through meticulous data collection, Hart and Risley stumbled upon a wide gap between children from low-income families and children from high-income families. Financial disparities aside, it was found that by the time a child is ready to enter Kindergarten, a child from a low-income family will have heard 30 million few words than a child from a high-income family. 30,000,000. That is a whopping gap when it comes to setting the educational foundations of our nation’s children. 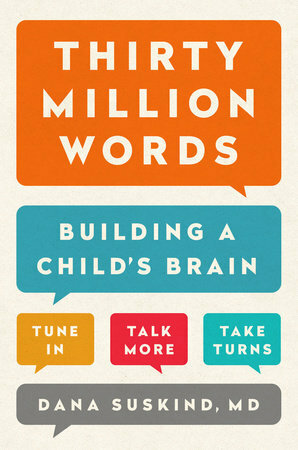 Studies have shown that by the time a child is 3 years old, 80% of their brain has developed. By the time a child is 6, 95% of their will have been developed. The very early years, the zero to 3, are monumentally important for a child’s future academic and personal success. But since preschool doesn’t normally start for children under they turn 3, and the Kindergarten starting age is around 5, there is large number of children that fall under the educational radar. by paying attention to what your child is communicating to you. with your child using descriptive words to build his vocabulary. I really did enjoy Suskind’s book, but all while reading it, I felt like something was lacking. She spent a great portion of the beginning talk about the research that she conducted, which was great. But then, when she got to the actual 3 T’s (or 3 C’s in Spanish) the chapters were short and didn’t really provide very many tips. The main points of the book can be summed up as: Talk to your kids. Read, Sing, Play. Engage with your children. I think her ideas and research would have been better suited as a long article rather than an entire book. I do love her bibliography and it has given me a huge list of articles and books to read as early childhood literacy has been my primary focus as a librarian during the last few years. Suskind’s program works as a workshop for parents. It is promoted as a curriculum that will help parents harness their strengths when interacting with their child. It teachers parents how to expand on ideas, how to talk to their children, how to observe what their child is doing and to build on those experiences. For the most part, this is a Chicago based initiative, and I’m curious as to their results of the program. This is a topic that hits close to home as I see and work with a number of children across the socio-economic range. I try to instill a sense of confidence and pride in parents that come to the library. My library system has taken part of the 1,000 Books Before Kindergarten initiative and we have sign-ups in massive numbers at the library and at outreach events. Parents care about their children and they want them to succeed. It’s just that so few parents know that the first 3 years are really the most important when it comes to creating a scaffolding for the future. This is a good book for anyone wanting to get their feet wet in the data of early literacy. There are so many excellent resources out there. I really feel as if there is a new emerging focus on the Zero to 3 age-range right now, and I’m excited to be a part of it.